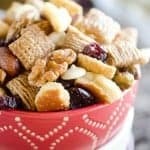 Cranberry Cinnamon Snack Mix is made with cinnamon Chex Mix & oatmeal squares, salted caramel pretzels, dried cranberries, white chocolate chips and mixed nuts for an easy snack perfect for the holidays! In a small bowl, combine the melted butter, honey, cinnamon and salt. Give it a quick stir and our it over the cereal mixture in the roasted pan. Spread the snack mix over wax paper and allow to cool. Mix in the chocolate chips and store in an airtight container.